Seeking a Beach Holiday Cottage Cornwall | You've found it! Cornwall's golden sandy beaches and clear blue seas await, just bring the fun. Surfing, Sunbathing, Seshell Searching, Sandcastling ... or just a spot of Snoozing? What ever you want, Littel Molvenny is the perfect beach holiday cottage in Cornwall. Little Molvenny is a cottage with beaches galore on Cornwall's south west shore. For a family friendly holiday,romantic break, surfing, swimming, sandcastles and sunbathing on golden sands await you at the one of dozens of beaches to enjoy. 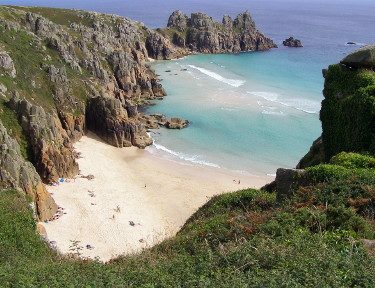 For a family friendly fun just walk down to Porthcurno's main beach, which has lifeguards patroling. This is a gem on the doorstep with fine sand and a small stream down its side that your children will love to play in. This beach is relatively sheltered and does get busy, and you must swim between the marker flags put out each day by the lifeguards depending on the weather conditions. You do find bodyboarders here too on the usually modest waves, though they can be big after storms. For even more details about the beach, facilities nearby, directions to get there and more, here is a handy guide you can download or print out. Out of season there are no lifeguards on Porthcurno beach and at that time dogs are allowed. Out of season the main Porthcurno beach carpark is free! The beach is owned by the National Trust and does not allow fires. Buried beneath this beach are numerous fibre optic cables that bring the internet ashore here, from the rest of the world, so while soaking up the sun you can also say you are surfing the internet! 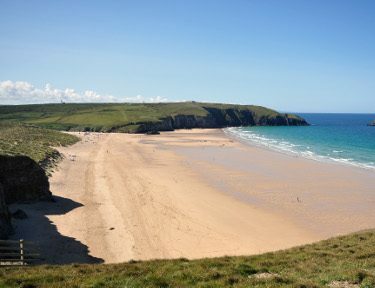 Ten minutes walk to the west brings you to smaller Porthchapel beach, which does require a short, steep climb, making it often less busy, and more adventurous and popular for riding waves. You need to bring your own supplies here, so whip up a great picnic in your self-catering cottage! For even more details about the beach, facilities nearby, directions to get there, when you can take the dog to the beach, here is a handy guide you can download or print out. Pedn Vounder beach is to the east of Porthcurno, maybe half an hour on foot from your the holiday cottage. It's a half hidden beach but very popular - you can just glimpse part of it from the coast path, a jewel in the green sea. It's a steep walk down with a twenty foot climb over rocks at the base, but well worth it once you step onto the fine sand, under great cliff walls of rock. 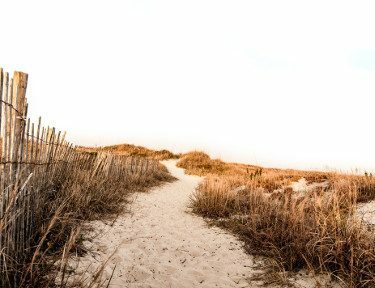 As the tide goes out a wide expanse of sand opens up, but as the time comes in, you may be temporarily cut off from the route in and out, so you need to arrive or leave before that or walk through waves! The seclusion of this beach has made it popular with naturists, though it has no official status and all sorts mingle amicably on the beach and the less visible rocks at the back. On the headland to the east of the beach is the location of the famous Logan Rock, a rectangular block of granite which weighs about 70 tons, and which can be rocked back and forth by one person. For even more details about the beach, facilities nearby, directions to get there and more, here is a handy guide you can download or print out. For full on surfing you want the north Cornwall coast, and your best beach nearby is at Sennen Cove, which has surf schools and equipment shops for wetsuits and boards. Sennen Cove has several fine places to eat, and also hosts the hugely popular Christmas day mass swim. Next to Sennen you have the very long beach at Gwenver, which can be less busy. The surfing hub of Cornwall of course is busy Newquay some forty miles away, but on a visit to nearby St Ives you can actually take your choice of four nicely different beaches from the town centre. Why not take a lesson with a pro: Sennen Surf school and shop - 01736 871817 Email - smartsurfschool@gmail.com For even more details about the beach, facilities nearby, directions to get there and more, here is a handy guide you can download or print out. You are absolutely spoiled for choice here in area with the most stunning beaches in Europe. However please be aware that there are strong rip currents and we therefore strongly advise to only swim on beaches with lifeguards and to stay within the life guarded areas. Good news that the beach just down the road at Porthcurno is lifeguarded! 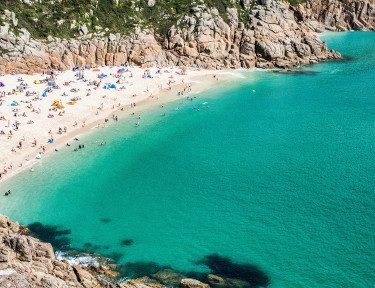 If the selection above isn't enough here are a more beaches to visit. Gwynver Beach A scenic white sand beach just north of Sennen Cove. Gwynver Beach is a really nice beach, which can be surfed, but there are no facilities and the path down is very steep. At low tide the sand stretches south to Sennen Cove. Cape Cornwall There is a small cove called Priests Cove with a pebble beach and lots of rock pools. There is also a small tidal pool. Its definitely worth climbing the footpath up to the Cape for spectacular views Praa Sands A huge sandy beach popular with families and surfers. Facilities and parking are close to Praa Sands beach. There is good coast path walking both east and west of Praa Sands Marazion There is a long sand and pebble beach which stretches to Penzance. There are good parking and facilities at Marazion and its definitely worth visiting St Michaels Mount. To visit St Michaels Mount use the causeway at low tide and use the ferry when the causeway is under water Hayle Beach An excellent 3 mile sandy beach that stretches from the Hayle Estuary to Gwithian Towans and Godrevy Point. 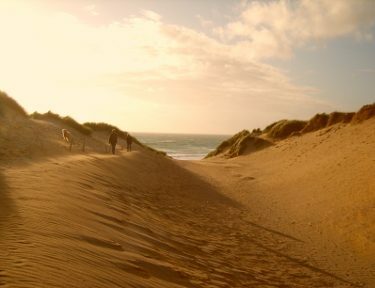 The lower half of the beach is close to the town of Hayle and comprises different sections of beach known as Hayle Towans, Black Cliff and Mexico Towans Gwithian Towans Beach Effectively the middle part of Hayle Sands, a huge sandy beach which stretches from the Hayle Estuary to Gwithian Towans and Godrevy Point. Gwithian Towns Beach is popular with surfers and for families there is plenty of sand Porthminster Beach The gateway to St Ives town, Porthminster boasts a half mile long strip of golden yellow sand & crystal clear water. 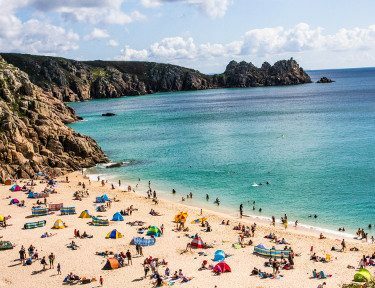 It offers safe swimming as well as organised beach activities for the children in the summer, mini-golf and the famous Porthminster Beach Café Porthmeor Beach St Ives largest beach Porthmeor has it all with great surf, good food & the famous Tate Gallery. You can learn to surf with a registered instructor or just take to the waves if you’re already a pro. Just up from the beach is a bowling green & mini-golf to while away a couple of hours or perhaps you’d simply like to relax with a drink at the Porthmeor Beach Café. Carbis Bay Beach Beautiful Carbis Bay offers safe bathing & is good for windsurfing & water-skiing. Lifeguards patrol during the summer. Porthkidney Sands Between Carbis Bay & the Hayle estuary, Porthkidney is something of a local secret. There is a small car park next to the church at Lelant, but you can also walk there along the coast path from Carbis Bay. Lifeguards patrol during the summer. Surfing You can’t come to Cornwall & not try your hand at Surfing. We also left you an original Cornish bodyboard. Instructions are on the card by the fireplace. Enjoy! 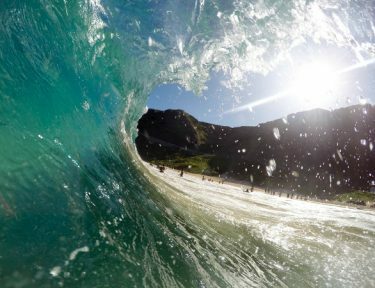 Porthcurno (for bodyboarding) or Sennen for both and Gwenwer beach for surfing pros are the places to go. Or why not take a lesson with a pro: Sennen Surf school and shop - 01736 871817 Email - smartsurfschool@gmail.com They also hire wetsuits and boards.